How is that possible? Low fat, low carbohydrates, and still deliciously sweet! And after getting your head around the concept of 'net carbs', you may still be wondering what are those sweeteners listed on the labels, such as mannitol, maltitol, sorbitol and others, and how they fit into your Atkins, Protein Power, South Beach or other diets. Known as sugar alcohols, these and other low carb sweeteners are being seen more and more in diet products. And usually you can find several types in your low carb food. Although they are all effectively no to low calorie sweeteners (0.5 to 3.0 calories per gram) they are generally much sweeter than sugar, which allows even the higher calorie per gram products to be classified as low carb and low calorie sweeteners. The reason you'll see a number of them in your low carb chocolates for instance, is simple. Food technologists have found that different combinations of low carb sweeteners can have a better flavor in certain foods than when using one type alone. For instance, if you're making muffins, you want a sweetener that can stand up to the heat of an oven. But if it won't give you the texture or 'mouth feel' you'd expect, then it won't be popular, no matter how low the carbohydrate count. If you were making a chilled low carb dessert or a low carbohydrate ice cream, you'd want it to be sweet when cold. So the bottom line is taste. Given recent attention to protein based fat replacements, which have great potential for use in all but fried foods, its easy to imagine that some new and tasty low fat, low carb, higher protein and low calorie treats will be coming soon. And that has brought out some strange concerns, such as the idea that if we're not protected from ourselves by banning these foods, we might starve by consuming too few calories from these low and no calorie dessert and snack foods. But after looking at some of the shoppers I saw during a recent trip to my grocery store, all I could think was, where's my low carb cheesecake recipe? Mike Boyd is an author and contributing writer for the popular www.healthylowcarb.com, an online information source for low carb diets, free low carb recipes, diet basics, books, product reviews and informative up to date low carb dieting research low carb cheesecake recipe. 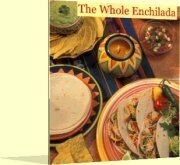 My free E-zine, The Whole Enchilada is more than just Mexican food recipes. Learn time-saving tips & techniques for cooking all kinds of food, including barbecue and seafood.